What is the Crew Role in Supported Ultra Races? Unlike other cycle races, Supported Ultra Races require that each solo racer and each team has support vehicles with them at all times during the race. This means that for every cyclist/team there may 3 to 10 crew members accompanying them at an Ultra Race. Not only is the participants performance dependent on their support crew, but also their safety! Working with a crew to ensure a safe and successful race needs some understanding of what roles the crew will play. Inspire India has compiled some resources here for participants of The Deccan Cliffhanger and The Ultra Spice Race, which are also relevent for other International Ultra Races. Crewing requires some intensive interaction with people who may well have been strangers before race day! While this ‘intimacy’ is not always a bad thing, it is a good idea for crews to come prepared to live without any personal space for the duration of the race! It is a good idea for crew to understand what they are signing up for beforehand, and judge whether they are suited for the tasks! Racers are advised to look out for suitable and unsuitable characteristics before deciding on their crew! Below – Saniya Patil’s Crew in Deccan Cliffhanger attend to her and her bike’s needs at the top of Pasarni Ghat. 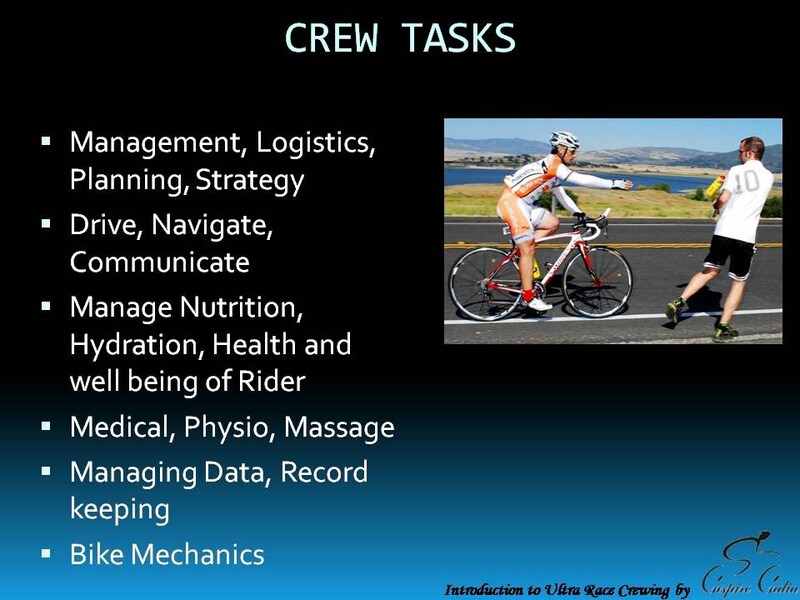 ALL ABOUT CREWING – Ultra Racers need competent and committed crew members to ensure their safety and their success! So what do Crew do?…. EVERYTHING… Except RIDE! Flexibility, resourcefulness and a sense of humour are essential! Crew MUST know the race rules, and all other details. The rider/team could face penalties or disqualification because of crew errors! And you DON’T want to be that guy! Navigation is a key task in getting from the start to the finish. follow your routebook and you will be fine. The crew member in the passenger seat of the Support Vehicle is generally the navigator. They will follow the route details in the handbook and communicate with the driver and racer where they are and when the next turn is. Everyone should know how to navigate as tasks change. Reading directions is usually not that hard and you can figure it out on your own. Keep the rider informed when s/he stops about turns or landmarks that are coming up. Give brief instructions about the route ahead.
. Type of junction or Signal.
. Any other notes we feel are useful, such as lonely sections or stretches where supplies are not available. Remember to reset the odometer at start! If you don’t or go off track you will need serious Maths skills to navigate by the routebook. • Flashlight/Headlamp – to see at night. A clipboard and additional pads of paper can also be helpful. At every Control Point, the crew must stop and get the card stamped and the time of arrival noted, or phone in, depending on race rules. Riders may continue riding, except at night. As you go thru each Control point, you should check it off in the routebook, and note the time of passage. The handbook has plenty of space to make notes or record time and mileage data which can prove valuable during the race. Many racers also like to review this data after the race. And for most racers, this is only one race in what will be a number of such events in future, the data is useful for long term participation. Race strategy and planning sometimes depend on this data as well. Some racers thrive on data like this. This can also give the Navigator something to do. • Times at each Time Stations. • Times at various turns or references points. • When and where racer exchanges happened. • When and where you filled up with fuel. • Average speeds for various sections and for each racer. • How long each racer is on the road? • How efficient your stops are. • Fuel efficiency of your support vehicles to know when the next fill up is needed. What happens if you get lost or are off course? If you go off the route, stay calm, use a GPS navigator if you have one. If not figure out your exact location and try and estimate where you went off course and how far you are from the point where you left the course. You may put the rider in the car to return to the point where you left the course. Call the race director before you put the rider in the vehicle. If you cannot get through, send an sms or a whatsapp msg to all Race officials. Sleep management is critical for everyone. If someone can’t function well because of lack of sleep, they are not much use to a racer, fellow crew members, or the race; they may in fact become a liability. No matter how you are involved with the race, don’t expect to get much sleep. You certainly won’t get your regular 8 hours; many crew and racers will not get more than 2-3 hours of sleep that day. You should also be aware that your sleep may be many bits of time versus one continuous block of time. The lucky ones are those that can sleep anywhere and in any position. When, where, and how racers and crew sleep could be some of the most critical and logistically challenging decisions of the race. In order for you to get sleep, it must be planned, it just doesn’t happen. Set out a plan so you get some sleep. • Try to powernap for 15-30 minutes at a time. • Even closing your eyes for 5 or 10 minutes without actual sleep may help. • If you can’t sleep, just lay back and rest and close your eyes. Team racers will be on a rotating riding schedule and thus can know when they have an opportunity to sleep. Obviously the plan is to sleep while another team racer is racing. The sleep schedule for racers and crew may be different and you must ensure everyone has some scheduled sleep. This particularly needs to be addressed if team members are riding and driving! You may have situations where you need to stay awake or you are part of a crew that follows a racer under night conditions. There are well known aids for staying awake. Caffeine in various forms usually works for most people. This can include coffee, soft drinks, tablets, or various energy drinks. Remember – trying to stay awake is not as safe as taking a quick nap. You also note that the race organisation takes safety extremely seriously and if a driver is deemed to be dangerously tired they will be told to stop by a race official. • Frequent eating gives you something to do. Cereal bar, raisins, nuts. • Drink lots and then you’ll have to use the bathroom, but you have to hold it since you’re driving. • Put the vehicle window down and have wind blowing on you. Or perhaps just aim the vents at your face. • Talk. Ask deep questions of life. Exchange adventure stories. Joke! • Jumping jacks, push-ups, sit-ups – something to get the blood moving. Some of these can be a challenge as while you are trying to stay awake, others may be sleeping. Do NOT use any anti-sleep drugs unless that is a normal prescription for you. Watch out for your riders performance. Crew should make sure that the racers are riding according to the plan or strategy that is chalked out. Your success depends on everyone getting sleep and functioning well. Look out for each other to ensure everyone is getting some sleep. It is also your responsibility to make sure you are rested and well and fit enough to proceed safely. It’s a rewarding experience to get there and push your limits. On the other hand, pay attention to when you’ve really hit your limits. Know when you are out of it and when you really need sleep. One of the most important things o remember is that it’s a team effort and you are all working towards a common goal. This means sacrificing some of your own comfort and sleep for the good of the team and to help the racers excel. This will give you some idea of what crew should (and shouldn’t) bring for the race. Bring enough clothing so that you can be adequately comfortable in warm or cold weather but don’t bring too much; there’s just not enough room and you won’t spend much time outside, you’ll likely be in a vehicle with heat or air conditioning. • Remember space is at an absolute premium for everyone. • Bring items that you aren’t too concerned about getting beat up. 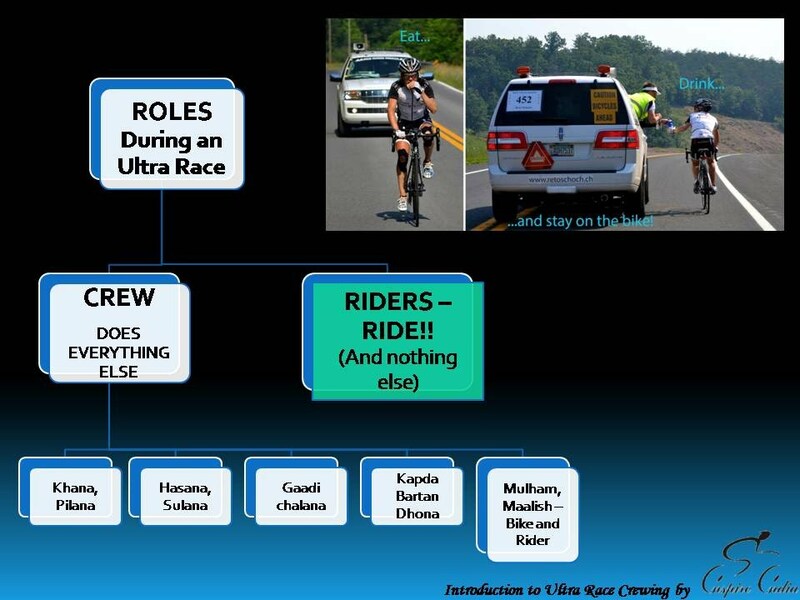 In order to enable cyclists who are new to the Ultracycling format to have safe and successful Ultra Race Experiences, Inspire India has created a presentation that introduces some aspects of Preparation and Planning, along with the audio recording. Note: Play the audio as you watch the Slideshow below, for better understanding of the content. 1. Ila Patil – who has been involved in all three aspects of the race, as a team racer, crew and an official. And became the first woman from India to qualify for RAAM at Deccan cliffhanger 2016! 3. Nitin Takale who Qualified for RAAM at the 3rd edition of The Deccan Cliffhanger. downloads will be uploaded from time to time. ACCLIMATIZATION IS ESSENTIAL…. NOT JUST TO PERFORMANCE…. BUT TO SURVIVAL! Useful links to understanding how to acclimatize. Curated with help from Sumit Patil.